I’m always looking for new ways to cook just about anything! I had never done a breaded pork chop so when I can across this recipe on allrecipes.com I decided to give it a try! You can play with the flavor of these breaded chops by adding other herbs and seasonings to the coating. In small bowl, combine flour, salt, paprika and pepper. In another small bowl, combine egg and Worcestershire sauce. 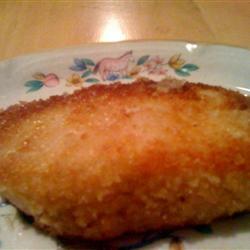 Coat chops with seasoned flour; dip in egg mixture, and coat with crumbs. In large skillet, heat oil over medium-high heat. Brown chops on one side until golden brown (about 4 minutes); turn and continue cooking for another 4 minutes. Serve hot.